Fin Whale. Photo courtesy of NOAA. This was an exciting week off the coast of San Diego. Overall there was exceptional diversity: We saw gray whales, fin whales, bottlenose dolphins, Pacific white sided dolphins, common dolphins, mola mola, bait fish, and a blue shark! Unfortunately, we also saw an injured whale that may have been hit by a ship earlier in its migration. The gray whales continue their southbound migration. We witnessed fast whales, slow whales, juvenile whales, and adults. One day we saw a small juvenile breach three times. We also saw a fin whale feeding about 10 miles offshore. Fin whales are the second-largest animal on Earth behind blue whales. They can grow up to 88 feet long, almost twice the size of gray whales and almost as long as our 94-foot whale-watching boat. The whale stayed very close to the boat and swam directly underneath us. While further offshore, we also saw a blue shark. It is unusual to see sharks on our whale-watching cruises, and this shark passed right by the boat! Blue sharks grow up to seven feet long and can travel long distances to find fish and squid in their open-ocean habitat. Birch Aquarium at Scripps naturalists spotted this injured gray whale during a whale-watching cruise in February 2010. Photo by Rebekah Bohm. 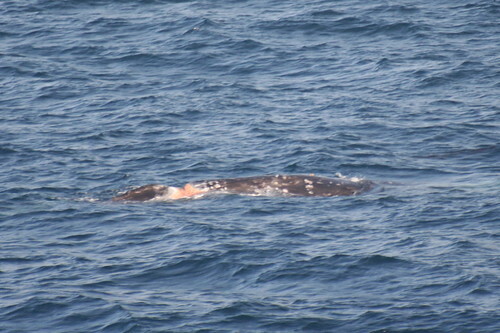 Sadly, this week we also saw a gray whale that had been injured on its migration. This adult whale was traveling in the company of two others and was swimming very slowly. The whale’s natural predators – orca or killer whales – may have caused the injury or a ship may have hit the whale. A National Oceanic and Atmospheric Administration researcher said the wound did not look recent, so it was unlikely that it had been injured near San Diego. Unfortunately, ship strikes are a real danger for many types of whales and often neither the ship captain nor the whale realizes it is in the wrong place until it is too late. Hopefully the whale will make it to the lagoons where it can have time to heal before the long migration north. 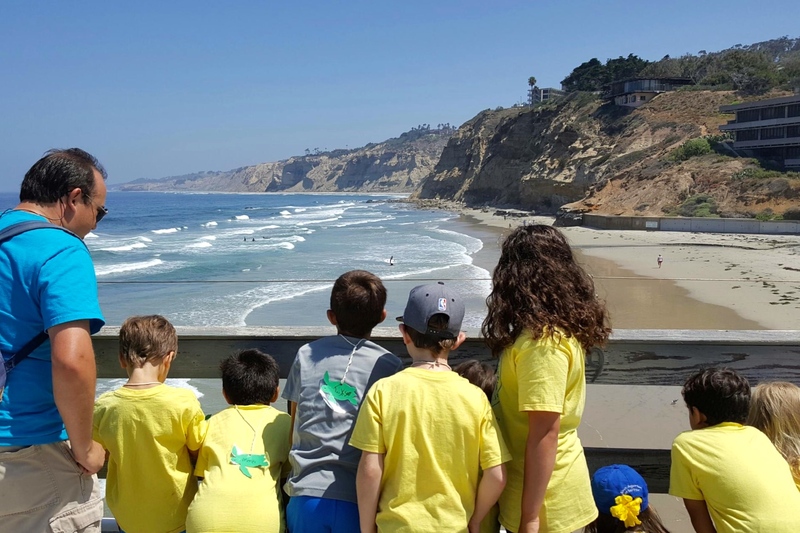 Last weekend, Birch Aquarium at Scripps took a group on our first trip this season to the whales’ Baja California birthing and feeding lagoons (see video here). All of the guests interacted with and touched adult and juvenile gray whales. We also saw a lot of whales in the distance, as their mothers were too cautious to bring their calves closer to the boats. By the end of the season, however, the calves will be confident enough to interact with the boats under their mother’s watchful eye. Some of the highlights we witnessed on the trip were seeing the gray whales mating as well as a calf play with a strand of kelp. It is truly a once-in-a-lifetime experience. Birch Aquarium naturalists are traveling in Baja with a second group until Sunday. We can’t wait to hear stories of what they witnessed! Our final Baja trip takes place March 24-28. Visit our whale-watching page for more information.